The NFL is a dictatorship masquerading as a benevolent dictatorship. In redistributing $46 million in salary cap space from the Redskins and Cowboys to the rest of the league, the NFL is enforcing laws that don't exist, playing Robin Hood with blackmail, and generally continuing a tradition of arbitrary, paternalistic horseshit that in a just world would have antitrust lawyers salivating. It's not a just world, of course. It's the NFL, where they can publicly humiliate and financially chastise two of the richest, most powerful, most visible and most hands-on owners. They can flat-out tell Dan Snyder and Jerry Jones "we don't like the way you do business" and come up with a retroactive punishment based on no extant rules and dare them to do anything about it. And Snyder and Jones can't, because their strange bedfellows in this mess, the NFLPA, was bought off. "What're you going to do about it?" the NFL scoffs, already knowing the answer. Let's go over what happened here, because it is amazing and incredible and a simple recitation of facts defies belief. Because of an expiring CBA, there was no salary cap in 2010. Washington and Dallas, because they have good accountants, took advantage of this by frontloading player contracts—paying a ton of money in the uncapped year in exchange for paying less in later years. The players didn't mind because they were getting their cash either way, and the teams benefited because they'd receive a discount on future cap hits. Just about every team did this to some extent, as shown by this graphic which is winding its way through the internet. 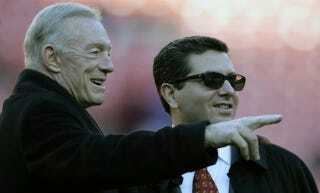 But the Skins and Cowboys were particularly aggressive: Washington carried $178.2 million in 2010, Dallas $166.5 million. Snyder and Jones were reportedly warned "at least six times" that there would be consequences (yes, this is blatant collusion), but here's the thing, and it's really the only thing: they were violating no rules. Can we repeat that, for posterity and for effect? The season was uncapped. There was no cap. Teams stayed under a cap the year before, and the year after, but in the year of no cap, they spent what they wanted. There was nothing in the then-extant CBA that could have been used to penalize them for this. Hell, there was nothing in the next CBA, even though that would have been an ex post facto law, and illegal under any constitution worth its salt. So even if the NFL warned Washington and Dallas not to do what they were doing, Snyder's and Jones's lawyers would have pretty quickly concluded that there was to harm in using a loophole, and no risk either. "The Management Council Executive Committee determined that the contract practices of a small number of clubs during the 2010 league year created an unacceptable risk to future competitive balance, particularly in light of the relatively modest salary cap growth projected for the new agreement's early years. To remedy these effects and preserve competitive balance throughout the league, the parties to the CBA agreed to adjustments to team salary for the 2012 and 2013 seasons. These agreed-upon adjustments were structured in a manner that will not affect the salary cap or player spending on a league-wide basis." Ah yes, competitive balance, the old fallback position for any arbitrary dictum. I hope everyone saw what just happened, so we can all savor the irony: the NFL is making up rules as it goes along, and applying them retroactively, all in the name of the sport's integrity. There's also no legal force to that statement beyond "because we said so." As a sop to bipartisanship, the NFL claims that "the parties to the CBA" agreed on this punishment. Not the CBA itself, mind you, because there's nothing in there. But the NFLPA signed off on the penalties, not because they agreed with them, but because they had no other choice. The only other option the NFL presented the Players Association was for the salary cap to drop across the league, meaning less money for the players. This was a devil's bargain: sign off on this capricious and probably illegal sanction of two teams, or we'll punish all of you. The NFLPA was straight blackmailed, and they did the only conscionable thing they could: they caved, and threw two of the biggest-spending owners under the bus. In the Book of Genesis, God inexplicably created the tree of knowledge, then told humans not to touch it. "Because I said so," I believe was the rationale. He made the fruit tempting, and gave humans the faculties to obtain and enjoy it, and got pissed when they did. It took a couple thousand years for people say, whoa, that was pretty cruel and fucked up, God. Similarly, the NFL created an uncapped year, and fostered an atmosphere that gave Dan Snyder and Jerry Jones the motive, the means, and the opportunity to partake of its blessings. The NFL doesn't have religion's PR, so thankfully we don't need iconoclasts, just normal, rational people to point out just how wrong this is. But football is a sort of religion, with a similar antitrust exemption, so fair doesn't even come into play.